A slow cooker beef stew with chorizo is the perfect recipe for a rich and comforting meal for your family. 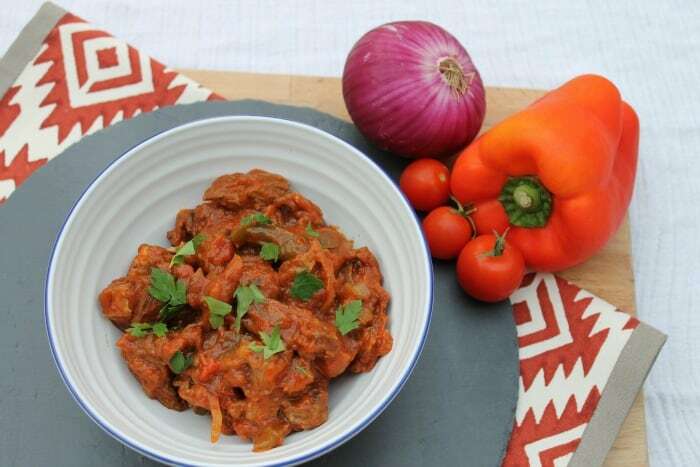 In this recipe I’ve used chorizo and smoked paprika to make a warming stew with a delicious smoky flavour. 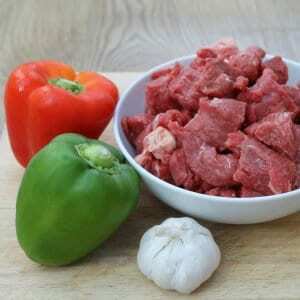 Beef, red onion and red and green peppers are cooked all day to produce a comforting meal for the coldest of days. Now that autumn is here, more and more of us are no doubt dusting off the slow cookers again and using them to make one-pot meals and casseroles. 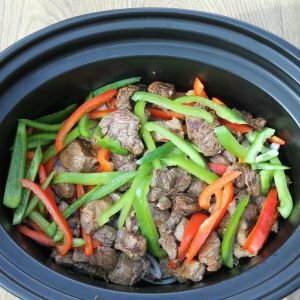 While I don’t really stop using my slow cookers during the spring and summer, I certainly notice that I use them more when the temperature drops. For this recipe I used organic ingredients, so this recipe good to try out for Organic September if you haven’t cooked organic before. But you don’t need to use organic ingredients of course, and it will work just as well with standard ingredients. As with most of my recipes, just brown off the meat and chorizo then add the rest of the ingredients to the slow cooker and get cooking! I prefer to brown off the meat as it adds flavour and also seals the meat and gives it a nice texture after cooking. It even looks delicious before cooking, kids will love this! 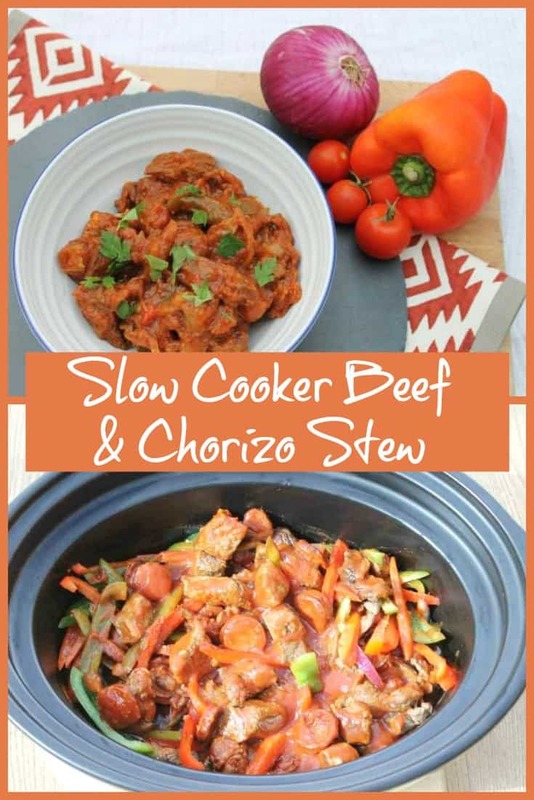 Pin my slow cooker beef stew with chorizo for later! Place your sliced red onions in the base of the slow cooker pot. Brown the diced beef in a medium hot pan (dry fry, without oil), in two batches. Place it in the slow cooker and add the sliced peppers and crushed garlic. Fry the chorizo gently in the same pan you used to brown the beef. No oil is needed as the chorizo will produce some as you cook it. Add the chorizo, passata, and stock cube dissolved in the boiling water and smoked paprika to the slow cooker and combine all the ingredients by mixing with a spoon. Cook on low for 7-8 hours. Serve garnished with chopped parsley or coriander, and serve with rice, mash or pasta and crusty bread. 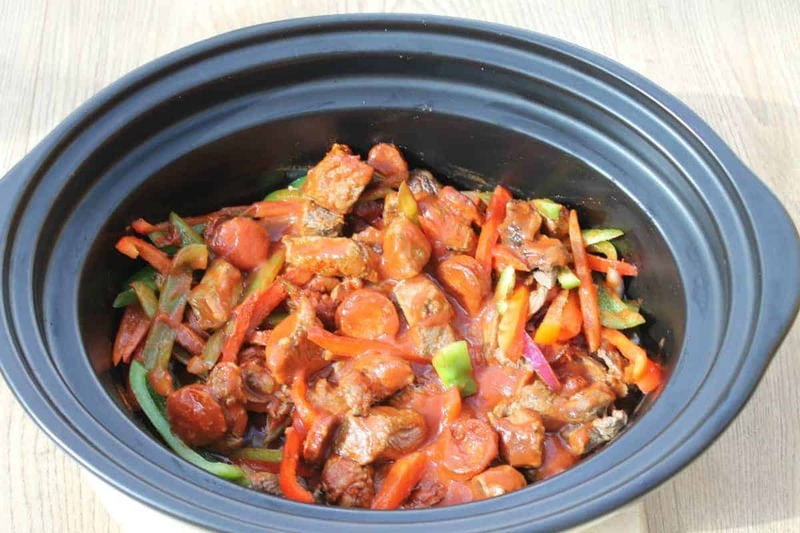 Check the stew one hour before the end of cooking, and if the sauce needs thickening, make a paste using a tablespoon of cornflour and a little water, then stir it into the slow cooker pot. Allow it to cook for the remaining time, and it will thicken up.